A gluten-free, Non-GMO, whole food bar that is an ideal snack for anytime of the day. These whole food snack bars are packed with key ingredients from real foods such as dates, blueberries, pumpkin seeds, and cranberries. 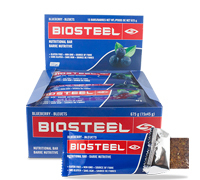 These gluten-free/Non-GMO bars also contain 12 grams of high quality whey protein isolate. Every bar is free of any artificial sweeteners, flavours, or colours. Whole Fruits: A combination of whole dried fruits that contain antioxidants and key vitamins. Greens: Organic Spinach and Broccoli powder. Whey Protein Isolate: 12 grams of this high quality, easily absorbed protein powder. Anytime of the day as a healthy snack. Ingredients: Dates, Whey Protein Isolate (Milk), Wild Blueberries (Wild Blueberries, Sugar, Sunflower Oil), Pumpkin Seeds, Raisins, Hemp Hearts, Coconut Nectar, Cranberries, Almonds, Natural Flavour. May contain fruit pit and nut shell fragments.